Is it possible to divide a king's land among four heirs so that each heir's land shares a boundary with every other heir's land? What about five heirs? On a land with two lakes, it’s impossible to construct a circular path that winds the lakes multiple times without crossing itself…but it is possible with three or more lakes. 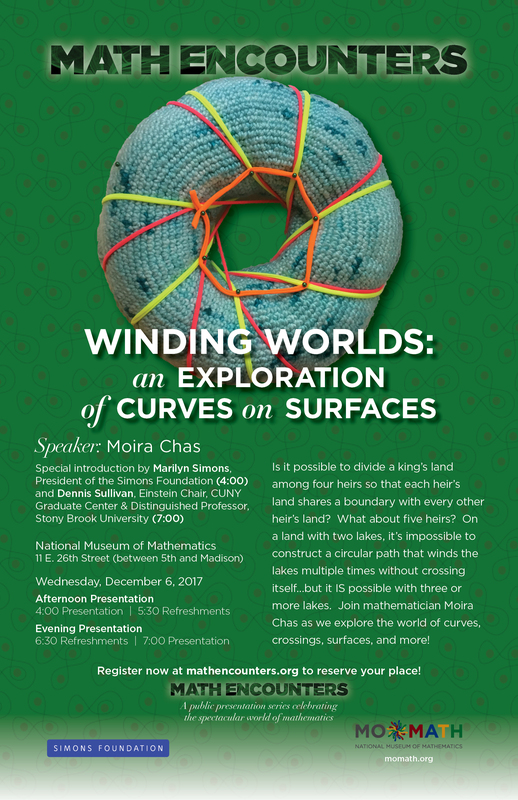 Join mathematician Moira Chas as we explore the world of curves, crossings, surfaces, and more! This page is for the 4:00 pm session. Click here to register for the 7:00 pm session instead. Please note, this presentation is designed to be accessible and engaging to a general audience. As a rule of thumb, it would be best enjoyed by participants ages 12 and up.